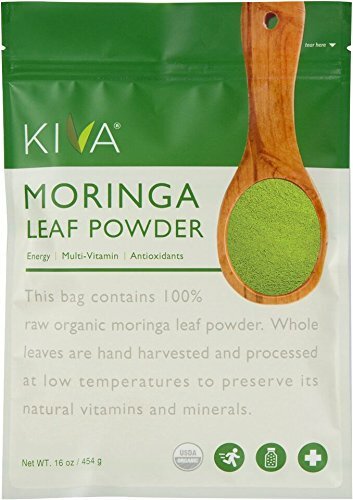 This is the summary of consumer reviews for Kiva Organic Moringa Leaf Powder - Non-GMO and RAW - (1 Pound). The BoolPool rating for this product is Very Good, with 4.30 stars, and the price range is $15.39-$19.99. Kiva Organic Moringa Leaf Powder is a product for people looking to find a natural vitamin supplement while promoting sustainable business practices. With over 20 types of vitamins, minerals, and amino acids, moringa leaf saves healthy shoppers from purchasing a pharmacy's worth of vitamin pills. Furthermore, healthy shoppers obtain these essential nutrients closest to their natural form without the poking and prodding of a scientific lab. Kiva is also fair-trade certified, so not only does purchasing this product promote Kiva's mission for innovative and healthy foods but it also fairly promotes the farmers of the moringa leaf in India. Some customers were turned off by the taste. Moringa leaf powder has quite a strong flavor. Some noted that Kiva's product didn't dissolve well in liquids, which is likely why so many recommend blending the powder in a smoothie. The thickness of a smoothie should help keep the mixture blended while masking the moringa taste. Other reviewers recommended to start consuming moringa leaf powder in small doses. Too much moringa could be hard on your stomach. Many reviewers started with a small amount once a day, but they gradually increased the amount and the frequency of consumption over time. Overall reviewers seemed committed to Kiva Organic Moringa Leaf Powder. Whether it is their sustainable business practices or the low price, customer loyalty is always a sign that the product is worth checking out. Resealable top is a little awkward. The powder just sits on top of my drink. She's in her early 70's and looks much younger. She raved about its health & medicinal benefits. It burned mine and my husband's throat for hours and made me get sick to my stomach and had sharp pain in the top of my stomach several hours after that. It's to early to tell how it'll benefit me. If it does, I'll order more and add more to my review. Works great for some, but not for those with a sensitive stomach. I've loved and supported Kiva from the first time I've ever heard about them!! This is my first time using moringa. After three days I'm beginning to feel the effect of it and sliming down too. I want to support your organization. I mix with daily coffee in the morning. I had a trigger finger, and my hands felt swollen in the morning. It appears to be an adaptor to help with nutritional needs your body is needing. I can't wait to see what else Kiva will offer from these farmers I've helped fund. XOXO thank you Amazon and Kiva!!! I started off with 1 teaspoon/day for 3 days 2 teaspoons for 3 days & finally 1 tablespoon thereafter. I started off with 1 teaspoon/day for 3 days; 2 teaspoons for 3 days & finally 1 tablespoon thereafter. I gradually started with 1/4 of a teaspoon in my breakfast smoothie each week until I reach a tablespoon 3x a day. It may work for others BUT start slowly!! I do believe it's starting ease my arthritis pain. Just started using in the morning but so far it's been great!. I started taking this product after researching the benefits of moringa leaf powder on inflammation. I started taking the moringa powder as soon as it arrived. It's been about a little over a week, and my energy has increased. I'm thoroughly impressed with the product. I've reordered & highly recommend to others. Blends easily in morning smoothie. Bitter taste, even in my smoothie. I drink a green smoothie every morning with this now. I like to mix it into smoothies. Powder was very fine and easy to blend into drinks or smoothies. Added to my smoothies for extra health! Use in smoothie for its antioxidant properties. Healthy and great to add to smoothies. This nutrient dense powder works great in smoothies or protein shakes. This product has many health benefits, but don't use too much in a smoothie as it does color the taste. Superior product, and I'm already referring this product to everyone I know. Great product, tastes fine in my smoothie. The kiva moringa was good, a quality product. I heard about this product from friends. This product was recommended by a friend. Overall, the product is always good with a pleasant taste. The product is packaged very nicely and tastes very fresh and I feel healthier after putting into my water bottle. Delicious, Moringa has a green taste and is similar to wheat grass in taste. Lovely taste...yes like fresh grass. Tastes great with juices and smoothies!. The taste is horrible. You should mix this with something to make it taste better. It's super green and tastes like a green leafy plant should taste (something I prefer). For taste it's actually very tolerable no nasty after taste. Tastes great, and so healthy too. It didn't taste bad at all.